The intuitive Canon i-SENSYS MF-623Cn colour multifunction printer is designed for SOHO users. This laser printer can also scan and copy. Using an all-in-one cartridge, replacement and maintenance of components is fairly easy. The Canon i-SENSYS MF-623Cn printer offers seamless support for mobile printing. It’s also compatible with cloud-based services. With powerful scanning, this model allows for quick archiving, capturing and sharing of documents. 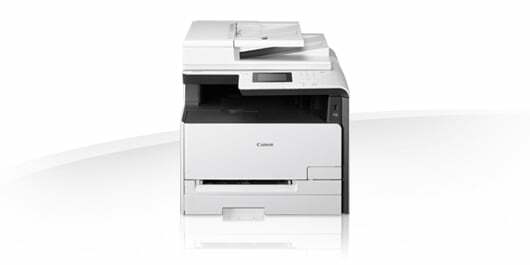 The all-in-one Canon MF623Cn colour printer doesn’t have a fax function. The Canon i-SENSYS MF-623Cn colour laser printer measures 430 x 484 x 429mm and weighs 26kg. it comes with an 8.9cm touchscreen display. For media handling, the i-SENSYS MF-623Cn laser printer comes with a 1-sheet manual feed slot, a 50-sheet automatic document feeder and a 150-sheet cassette. A USB host is on the front while USB and Ethernet interfaces are at the back of the MF 623Cn laser MFP. The Canon i-SENSYS MF-623Cn A4 colour laser multifunction printer boasts a print quality of 1200 x 1200dpi. For a small unit, the Canon MF-623Cn A4 multifunction laser printer is quite impressive with its excellent features. Users can save on running costs as this model has low power consumption and also offers a toner save mode. The print speed of the i-SENSYS MF623Cn printer is quite slow at 14ppm for monochrome and colour prints. This unit could be better if it also has a fax machine, Wi-Fi connectivity and an automatic duplexer for double-sided printing.